Do you know that one of my weaknesses is my great love for cakes? In today's world where every woman fancies of maintaining a slim figure and doing everything to diet, here I am with my undying love for cakes! Good thing that I am a person with a fast metabolism. I really never get fat no matter how much I eat. Lucky huh? Since cakes are one of my favorites, for sure that this is one of the things that I miss most. It's quite funny, but now that I am staying in a suburb, you can hardly find a decent bakeshop selling cakes and breads. The result? I'm craving for cakes! I remembered that during my last vacation at home, I'd been having cakes to my hearts content (lol). 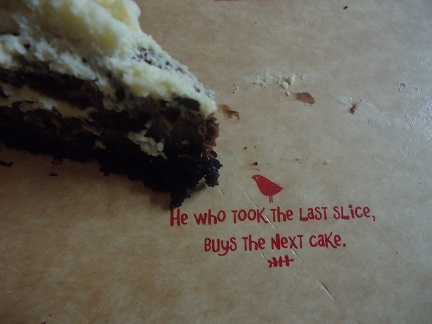 I bought several cakes like Mango Cake and Chocolate Mousse, both from Red Ribbon. I really love Red Ribbon cakes! It's too bad that I can't have even a slice of cake for Christmas.